A dust-up between architects and the Prince of Wales over a speech and a £1b development is bringing the age-old battle between traditional and modern architecture to a head. Managing editor Tim Halbur summarizes the news. "[A] large number of us have developed a feeling that architects tend to design houses for the approval of fellow architects and critics, not for the tenants." The broadside blast above came from Prince Charles, addressing the Royal Institute of British Architects (RIBA)- not in May of 2009, but in May of 1984. That speech became known as the "Carbuncle" speech, for the Prince's comment that a proposed contemporary expansion of the National Gallery was like "a monstrous carbuncle on the face of a much-loved and elegant friend." "Now there is something I've been itching to say about the last time I addressed your Institute, in 1984; and that is that I am sorry if I somehow left the faintest impression that I wished to kick-start some kind of "style war" between Classicists and Modernists; or that I somehow wanted to drag the world back to the eighteenth century." The Prince was being slightly disingenuous- it is clear through his words, activities and the work of the Prince's Foundation for the Built Environment that he has taken sides in the style wars, firmly in the traditional camp. 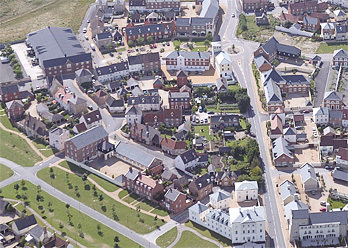 Working with architects like Leon Krier, the Foundation has created masterplans for towns such as Poundbury, using traditional English architecture to create a mixed-use, compact development hewing closely to historic English village models. They've also led a revival of pattern books and urban codes, promoting design standards with a traditional bent. And true to his earlier speech, he's led historic preservation efforts throughout the United Kingdom. The design for Chelsea Barracks rejected by Prince Charles. But there is a greater issue at stake in the British brouhaha. As Jonathan Glancey put it in 2004, the Prince's activities promoting traditional urbanism have extended into "a rather damp and foggy venture into the world of royal patronage." 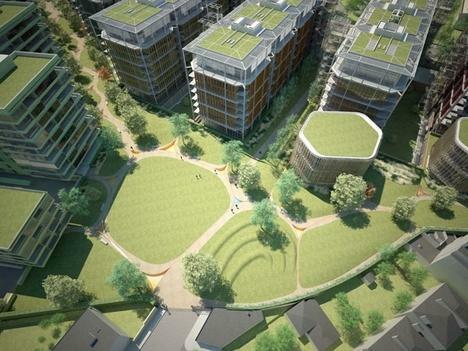 In April of this year, word came down that Prince Charles did not like a proposed 1 billion-pound development designed by Lord Rogers for Chelsea Barracks. The Prince reportedly used his influence to contact the Qatar royal family (who own the site), and by June, the plug had been pulled on the project. Shortly thereafter, a group of well-known architects, including Frank Gehry, Norman Foster, and Zaha Hadid, issued a letter lambasting the Prince for abusing his power. The letter states, "It is essential in a modern democracy that private comments and behind-the-scenes lobbying by the prince should not be used to skew the course of an open and democratic planning process that is under way." It continues to say that if the Prince wants to participate in the planning process, he should do it through proper channels as part of the public input phase. I'm certain that most of us on this side of the pond would agree that having a powerful figure step in and veto a building that had gone through layers of review and public input is unacceptable. Consider if Angelina Jolie, as a celebrity and a United Nations ambassador, decided she didn't like a proposed skyscraper that was planned in a New Orleans revitalization project and used her influence to nix it. And this isn't the first time the Prince of Wales has used his power to quash developments he didn't like. Architect Colin St. John Wilson, whose design for the British Library the Prince called "more like the assembly hall of an academy for secret police," has said that the criticism damaged his reputation so badly that he had to close his firm. "It was a bit like someone spitting in your face," he said. Certainly, the central issue is the obvious abuse of power the Prince is wielding on developments in the United Kingdom. Regardless, the coming together of this group of personalities -- starchitects and royals, modern and traditional architects -- has created a perfect storm to stir up the age-old argument over the benefits and perils of the two opposing styles. And yet, the language chosen by both sides of the issue show a misunderstanding of history. The "modernists" so hated by the traditionalists are long gone, and left behind a fairly small legacy of buildings: the skyscrapers of Mies Van der Rohe, the midcentury modern homes of Los Angeles. The bad buildings that plague our cities are not the result of architects, but developers using cheap construction methods and poor city zoning and planning codes. Contemporary architects, on the other hand, are guilty of over-intellectualizing their profession to the point of mystification, and occasionally making a statement building that fails to "meet the street", as planners say. As the Prince said in his May speech, "there still remains a gulf between those obsessed by forms (and Classicists can be as guilty of this as Modernists, Post-Modernists, or Post-Post-Modernists), and those who believe that communities have a role to play in design and planning." But the world of non-traditional, contemporary architecture is much more than a few "starchitect" designs, and involves many of the same approaches to urbanism that can be found in the Charter of the New Urbanism. The debate is less about two different approaches to architecture, and more about how buildings work on the ground and how they relate to the environment around them. As Alain de Botton put it last week in BD,"The real issue is how to pay homage to something old. Taking literature as a guide, it seems that a proper homage seldom looks like one. The genuine admirer of Shakespeare knows not to write in old-fashioned stanzas but rather searches for the underlying principles that made Shakespeare great." "Well-designed places and buildings that relate to locality and landscape that are, as the dear old Prayer Book puts it 'in love and charity with their neighbours' and that put people before cars enhance a sense of community and rootedness."